Ubuntu 16.10 Review: Not Bad, But if You're Happy with 16.04 LTS, Stick with it! After the previous 16.04 Long Term Release, Ubuntu has rolled out its latest ‘short term’ (my own naming convention for the non-LTS releases) version 16.10. Mainly, the ‘short term’ releases are only supported for 9 months and usually include software applications with their recent updates. When you release a new version of your operating system within every 6 months, usually there isn’t a lot of room for adding major changes. And that is the case with many GNU/Linux distributions these days, and Ubuntu 16.10 release is no exception. Since Unity is based on the user application set provided by GNOME desktop environment, according to the release notes, the underlying GNOME user applications have been upgraded to the version 3.20 at least (which is the case with the file manager -- ‘files’, for instance) and some others have been upgraded to the version 3.22 which is the latest release of GNOME currently. LibreOffice has been updated to the version 5.2 (now uses GTK3 menu-bars), Kernel version is 4.8, X.org version is 1.18.4 and now systemd (a core utility that is in control of system services and processes that run from the background) is used for the user session (‘user session’ is what takes place after the login manager, in very simple terms) as well. The ISO disc image is about 1.6 GB in size which has grown by around 100 MB more, compared to the previous Ubuntu 16.04 LTS release. Unity desktop version is 7.5 and it includes minor improvements and couple of bug fixes. 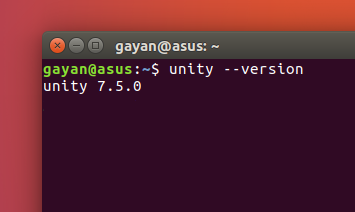 According to the Ubuntu Insights blog, this version of Unity should perform better on lower end GPUs and on virtual environments where the guest operating system doesn’t have direct access to the powerful GPU (if present). This has bee achieved mainly by reducing the amount of window effects & animation details when switching between applications, menus launchers and while minimizing applications. I installed Ubuntu 16.10 into the rotational disk, completely bypassing the SSD. The rotational disk has a separate EFI partition, a boot partition, a 20 GB ‘test’ partition (which is where I installed Ubuntu 16.10) and the rest of the space is reserved for the ‘Home’ partition of my main operating system (which is Ubuntu 16.04 LTS currently) where all my data is permanently saved. The SSD is used as the ‘root’ partition of the main operating system only (it also contains another EFI partition that’s only used by the main operating system), which again, played no role whatsoever concerning Ubuntu 16.10. 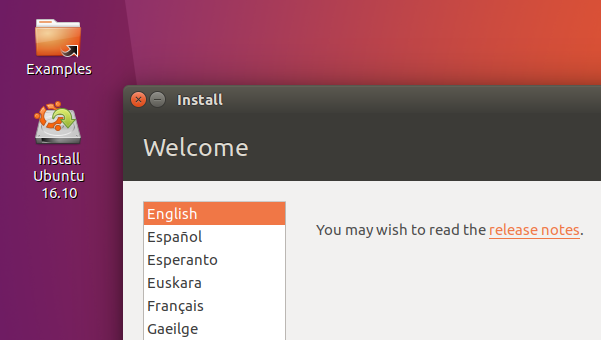 I’ve always loved the Ubuntu’s installer. It’s simple, easy to use and very stable and that’s something I say almost on every one of my Ubuntu reviews, and this release is no exception either. As far as the changes are concerned, I could see none. I couldn’t notice any change in GRUB theme and the boot-logo, thus I decided not to add screenshots here (they are a little difficult to capture anyway). Again, there are no obvious major changes, except for the new default wallpaper. 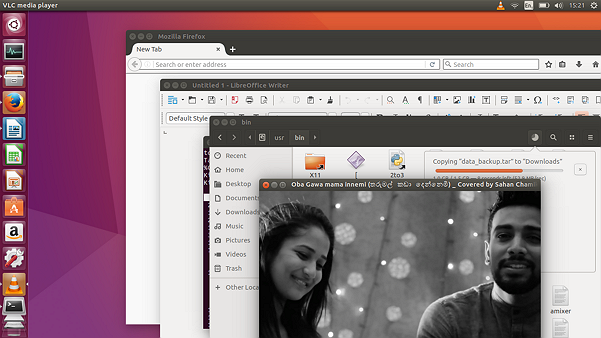 This time, though it still retains the ‘Ubuntu look-n-feel’ that it had for long time, it’s a little bit more changed. While it’s true that I was never that impressed with the default set of wallpapers included in Ubuntu, this time there are couple of nice wallpapers. Apart from that, the desktop right-click context menu has also changed slightly. 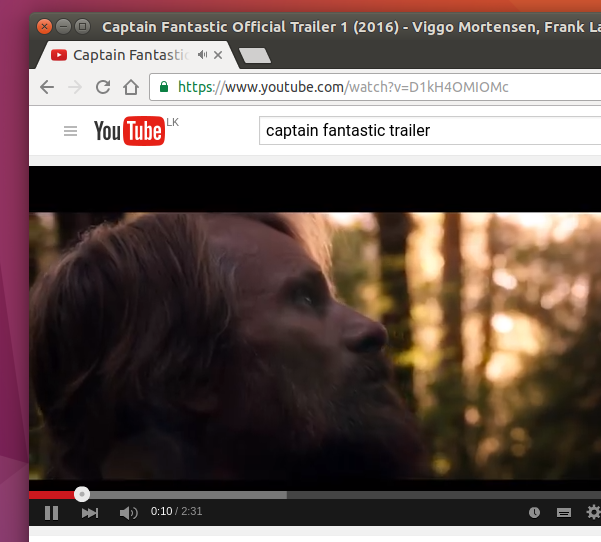 The first screenshot is from Ubuntu 16.04 LTS and the second one is from Ubuntu 16.10. In Ubuntu 16.10, as you can see, ‘New Document’ item has been removed, ‘Select All’ and ‘Properties’ items have been added (both useless on the desktop if you ask me), and the menu items arrangement is slightly changed as well. The context menu also looks quite wide because some genius over at GNOME (there are too many of them over there!) have thought that it must be quite useful to the end-user to display some of keyboard shortcuts for some of these functions. The desktop context menu change is mainly because Ubuntu 16.10 includes ‘Files’ 3.20.3 and it is ‘Files’ (file manager of GNOME) that provides the desktop right-click context menu. The file manager version is not the latest one, but it does bring few new features to the Ubuntu users for the first time. First of all, the classic menu-bar of the file manager is gone. Now, I don’t have any major complains over this as I rarely use functions from the menu-bar of Files anyway. However, without the classic menu-bar, especially in Unity where the menu-bar is displayed on its top-bar, things kind of look ugly! (what do you think?). Secondly, file copying (progress) is now displayed embedded into file manager’s main window. I complained about this ‘feature’ back while I was reviewing Fedora 23 (again, this version of Files is not the latest one, even Fedora 23 about a year ago came with it) because there was no way to see the progress unless you opened up the file manager. 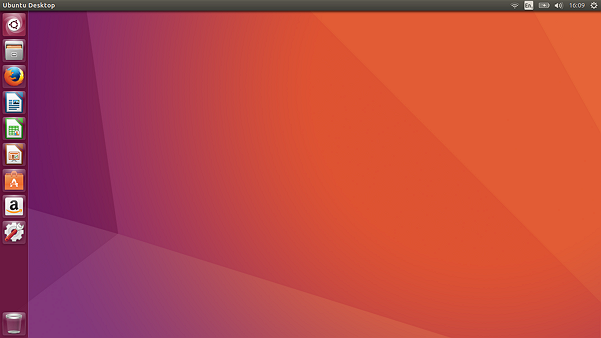 In Ubuntu 16.10, despite the ‘new feature’, the usual indicator is being displayed on the Files icon on the Application Launcher, however, it only gets updated if the file manager is opened! That said, when the file copy is finished, the indication disappears (as it should), but there is no indication in between. It’s probably a bug. When you rename a file, file manager now opens up a new pop-up box. When you delete something, for a few seconds, ‘Files’ gives you the ability to undo the operation without having to open the ‘Trash’ as well. I also like the new search box of Files. It’s much more compact and sits in the top middle of the file manager. And the other two configuration buttons right next to the search button, have also underwent some changes. Now you can change the folder zoom, sort, show hidden files, change into list mode, create new tab, create new folder, undo/redo etc directly from those two buttons. I’m sure there are many other subtle changes (most of which are due to the 3.22 GNOME application set), but these are the prominent ones that I saw in applications that I most frequently use. LibreOffice 5.2, Firefox 49.0, Thunderbird 45.3.0, Shotwell 0.22.0, Rhythmbox 3.4.1, Ubuntu Software (center) 3.20.1. That should do it. As for the Adobe Flash playback, since I’m using Google Chrome as the default web browser (yes I manually installed it), everything works with zero issues. No glitches, no crappy playback issues etc. I installed the latest Alpha version of Skype on Ubuntu 16.10 and made a quick call (for about 5-6 minutes, excluding the video feed. Video calling isn’t fully implemented on the Skype Alpha for ‘Linux’) and everything worked out without any issues. I didn’t come up with any problems with the indicator icon on the system tray area (the old version gives me issues sometimes on Ubuntu 16.04 LTS) either. Update: I’m having some issues with Skype version right now. Sometimes I can’t accept incoming calls, they just get dropped out. But this is most certainly an issue with Skype since it’s an Alpha version. As always, it was these data that I gathered first, after I finished installing the operating system. I made sure to make as little changes to the system as possible to keep the accuracy of the data high. The only manual changes I made were among enabling user-auto login, disabling the Update Manager from checking for regular updates (to keep the memory usage readings’ accuracy high) and finally added the System Monitor to the Application Launcher (this as I’ve explained many times, I always do in Ubuntu because if I were to open it up every time from the Dash for measuring the memory usage, that would’ve increased the memory usage by a lot because the first time you open Dash after loading the desktop it has to load few Dash related applications -- scopes, lenses etc to the RAM). Then I boot into the newly installed operating system 5-6 times for letting things to settle down. Only then, I started to measure the boot-up times, memory usage (upon loading the desktop), shutdown delay, CPU usage at idle, power usage and system responsiveness. Except for the last three tests, all the other times I took 5 samples of each test (yes I rebooted the computer after taking each sample) for coming up with average values. With the user-auto login enabled and Wi-Fi enabled connected to my wireless router, I started to measure (I use the Stopwatch of my phone) the time as soon as I hit Enter at the GRUB menu and stopped measuring as soon as the desktop was loaded and usable. Under some GNU/Linux distributions (usually KDE based ones), even if the desktop has not yet fully loaded some applications (system tray area), if it’s usable I stop measuring. 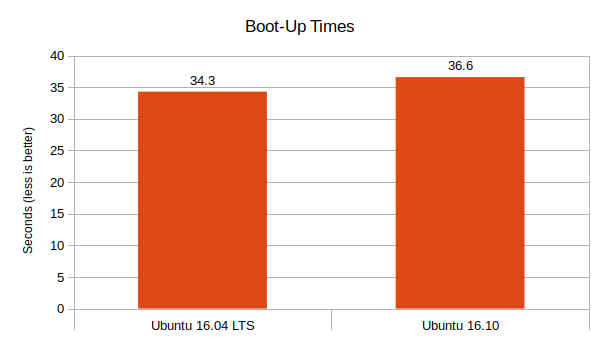 As you can see, Ubuntu 16.10 was roughly 6.7% more slower to boot compared to Ubuntu 16.04 LTS. 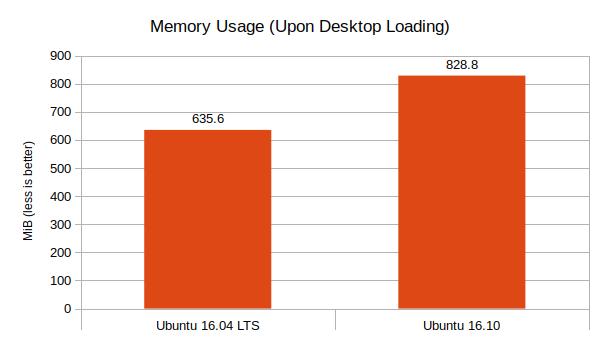 Compared to Ubuntu 16.04 LTS, Ubuntu 16.10 for some reason consumed about 30.4% more memory! That’s a big increase. Unfortunately I actually forgot to look for the possible reasons, and when it came into my mind much later, I had already made many changes to the system. 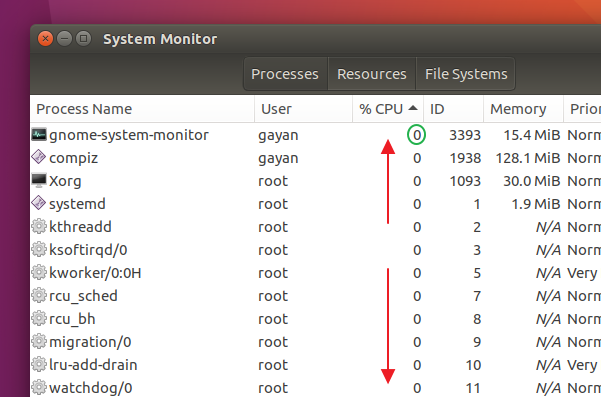 Nonetheless, this increase in memory consumption may explain the 6.7% delay of the boot-up times. At idle (when no applications are manually executed or being used by me) Ubuntu 16.10 did extremely well (so did Ubuntu 16.04 LTS as well). As you can see, it even registered zero CPU usages, and for long periods (15-20 seconds) the CPU usage stayed between 1-0%. Excellent!. 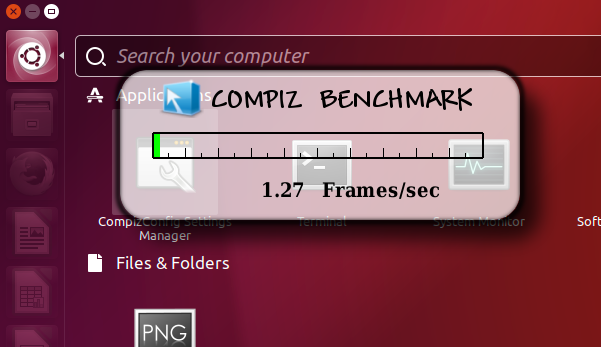 I use an application called ‘powerstat‘ (developed by an Ubuntu engineer -- Colin King) and there is no need to run this test 5 times like the other tests I manually run because this tool is designed to be extremely efficient and accurate. It takes a lot of samples for arriving at the average values. When measuring power, I made sure the screen brightness is set to its maximum (turned off any setting that would turn it OFF or dim or could put the laptop to sleep etc), I was using power friendly Intel HD Graphics 5500 GPU, Wi-Fi was turned ON connected to the router, and Bluetooth was turned OFF. Below is the graph that I created. Then I installed TLP (a power usage optimizer), this is a utility that I always use on my primary operating system, and after installing it I re-measured the power usage and as you can see from below, it further reduced the power consumption of Ubuntu 16.10 by around 16.7%! If you’re having battery life issues, than I highly recommend this application. You just have to install it (sudo apt-get install tlp) it’ll do the rest. In almost all occasions, it requires zero manual configurations. 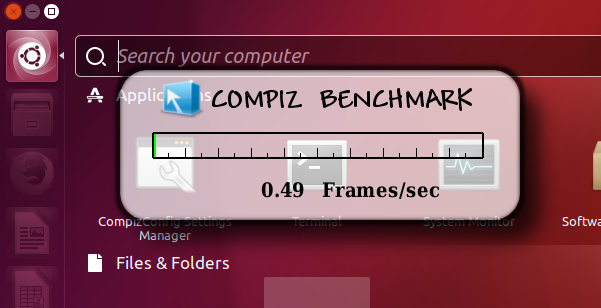 Compiz is the piece of software that lets you move (including Close, Minimize and Maximize) your application windows around the screen. It also adds fancy effects to them (Blur, minimizing effects etc) as well. You see, your computer screen is actually like a video animation. And as you know, video animations basically include lots of moving still images. And because they move a lot of these still images within a second, people get to witness the illusion of a ‘motion’. And the more of these still images need to be shown within a second on your screen (the technical term for this is ‘Frame Rate’), it means more work for the CPU and especially for the GPU (that’s your Graphics card). And the more the CPU and the GPU is under load means more work for the computer. If it’s a mobile device, such as a laptop, that will increase the power usage, thus shortening the battery life. So, an efficient operating system should be able to keep this frame rate as low as possible, when nothing is happening on your screen. So for instance, after working on your computer for a couple of minutes, if you close or minimize your applications, and took a break, it means there aren’t a lot of things happening on the screen. When that happens, the operating system decreases the frame rate to save power. And if suddenly you started to bring a minimized application to the front, that in effect will suddenly increase frame rate. 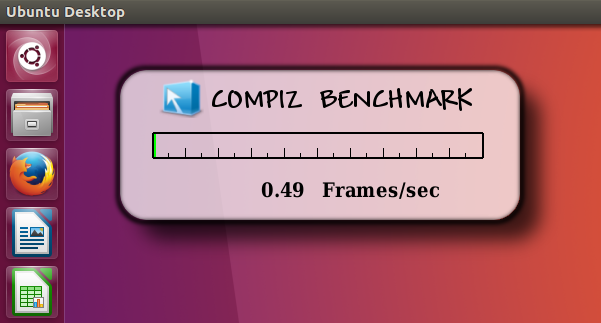 In Ubuntu, there is a Compiz plugin that lets you see the frame rate, and I’ve been using it to observe how well the operating system does when let to idle in my past Ubuntu reviews. I observe the frame rate when the desktop is idle, when the Dash is opened (full screen mode) and let to idle, when the Dash is opened (windowed mode) and let to idle and finally when HUD is opened and let to idle. The reason I chose these four is because in the past different Ubuntu versions have behaved strangely on these circumstances (yes I came up on them quite accidentally. I’m a freak, I know! 😀 ). Meaning that under some releases the frame rate increases rapidly (usually when I open Dash or HUD), and on other release, frame rate stays quite low (close to zero or 2 frames per second). 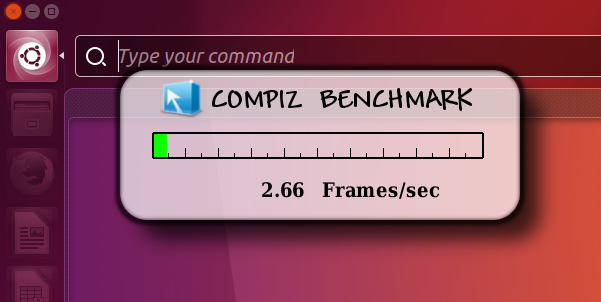 So out of this habit, when reviewing a new Ubuntu release, I always test the Compiz frame rate under these circumstances and compare the results with the previous releases. Here too I’ve done just that with Ubuntu 16.10. And I’m happy to say that, just like in Ubuntu 16.04 LTS where the frame rate on all these 4 occasions stayed quite low, under Ubuntu 16.10 too things were the same. Very nice! Ubuntu 16.10, just like Ubuntu 16.04 LTS, recognized all of my hardware quite well, except for the touch pad. The thing about this touch pad is that all of its functions work perfectly well in GNU/Linux, but as soon as I put the laptop to sleep and later when I wake it up, the touch pad does not work. This is how it has been under all the 3 distributions (this is a new laptop), namely Ubuntu 16.04 LTS, Linux Mint 18 Cinnamon and Ubuntu 16.10. The only way to get it back is to restart the computer. This has been a major headache for me. Update: My touchpad is from Focaltech. If your laptop is equipped with a touchpad from a different manufacturer, then you most probably won’t be affected by this issue. Other than that, since it comes with dual graphics (Nvidia 920M, apart from the embedded Intel HD GPU), once I was done collecting all the performance related data, I also installed the Nvidia proprietary driver and Intel Microcode, and so far I have not come up with any issues (or even before installing the proprietary drivers for that matter). The OS was able to correctly restore the previously set screen brightness and was also able to correctly remember the previous state of the Bluetooth adapter (ON/OFF) while loading the desktop as well. When using Ubuntu 16.10, I received 3 application crashes, including an Xorg crash. None was lethal, but after one crash (I think it was the Xorg crash), everything worked fine, except that I couldn’t reboot or shutdown the laptop. Thus I had to switch to a different console (Ctrl + Alt + F1…F2…) and force a reboot. Other than that, for a non-LTS release, so far, I’m quite satisfied with the stability of Ubuntu 16.10. In my opinion, the real strength of any system can be measured when you exploit its most weakest point. In computing, one of the most weakest points of a computer is the main storage device because it is one of its most slowest components. Sure the SSDs have changed things bit (remember, Ubuntu 16.10 is installed on a much slower 5200 RPM rotational disk), but it is still quite slow compared other major storage devices that are closely associated with the CPU and the GPU. So when trying to get a sense of an operating system’s responsiveness, what I usually do is this. I copy a file (which is about 1.5 GB) within two folders of the currently logged in user’s ‘Home’, and when that starts to copy, I try to open a multimedia file (here I used VLC which I manually installed), and then I also try to open 5 or 6 applications (including few heavy ones) such as Firefox, LibreOffice Writer, Shotwell, Software Center, terminal (with the hope of running a command such as ‘top’) and I also try to visit a location using the file manager where a reasonably large number of files & folders are located so I can put a lot of pressure on the hard disk drive. And all the while, I also observe the mouse pointer sensitivity as well (because it’s usually a good indicator of your OS’s responsiveness). And basically that’s what I did in Ubuntu 16.10 (below screenshot is only an illustration). It was pretty good actually! VLC was able open up the playback reasonably fast and it only got interrupted twice only for a very short period (for a half of a second on each of the two instances I would say), and almost all the applications appeared on the screen before the file copy was finished. The file manager, even though struggled a bit while opening /usr/bin location, I was quite happy with the performance. And I don’t remember losing the mouse pointer sensitivity at all either. It was very satisfying. 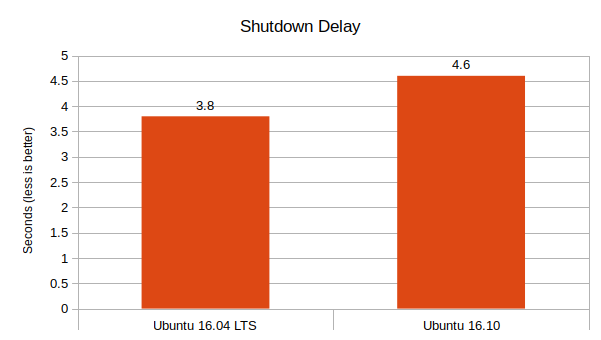 As you can see, here too, Ubuntu 16.04 LTS outperformed Ubuntu 16.10 by being 21% faster while shutting down. That said, 4.6 seconds of shutting down time is quite fast for an operating system anyway. 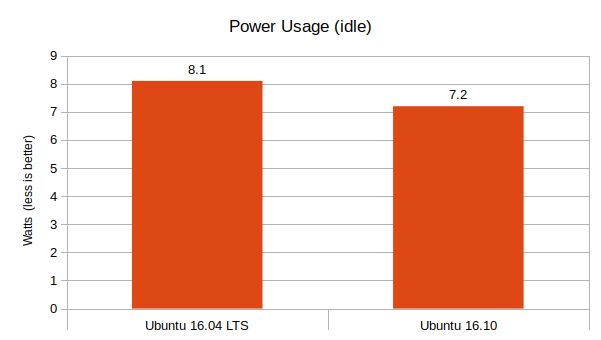 Performance-wise, Ubuntu 16.04 LTS outperformed Ubuntu 16.10 (except while at power consumption), though, other than the memory usage, the performance gap is not a severe one. And features-wise, there are no big changes in Ubuntu 16.10 either. Thus my conclusion is quite simple. If you’re happy with Ubuntu 16.04 LTS, then stick with it! Will I be switching over to Ubuntu 16.10? Yes. But I do it only because I like to keep a close eye on this latest Ubuntu release (plus, then I could write few articles to the website about Ubuntu 16.10 as well. I know I’ve not been that active recently). That’s pretty much all I have to say about Ubuntu 16.10. I’ll also come up with Ubuntu 16.10 flavors comparison in the coming days as well (yes, this time I’ll also include Xubuntu). If interested, download Ubuntu 16.10 from here which for a limited time, also includes a especially build Microsoft Office for Ubuntu for free (just kidding! 😀 ). Read the release notes from here. Thank you for reading and good luck. Sh*$ 😛 . Seriously though, the touchpad issue is a known one so I didn’t add one. As for the File manager issue, no I haven’t. Another nice review. Thanks Gayan. It’ll come, but might take a few more days 🙂 . Would you please have a look at Peppermint 7 too? It’s very difficult to give out promises Hosein because these days I’m quite busy in ‘real’ life, it’s very difficult to find the time to do the reviews. For instance, I’ve been delayed by at least a week for the Ubuntu 16.10 flavors review as well. Sorry about that 🙂 . Well the touchpad issues would force me back to Windows. I just don’t care to deal with something like that. Never had complaints with Linux on a desktop PC. But notebooks are certainly a bigger compatibility issue for Linux. You can really pull your hair out with graphic, wifi, or other hardware issues in notebooks. I agree, but remember that this is an issue which is directly associated with the Focaltech touch-pads under ‘Linux’. If your laptop’s touchpad is not a Focaltech touchpad, then you’re probably good to go. Very nice article. Explained very clearly. Thank you. I have few doubts. Whether 16.04 can be installed in a pen drive (og 16GB) ? How will be the performance? Will it be good to do this? One more doubt. I have 1TB SSHD disk. Shall I do partition and use First partition as Win10, another as Ubuntu 16.04. I heard if win10 is repaired or re-installed, grub will not show ubuntu boot. Hi! In first place my english is not very good, sorry! I’m new user in linux ubuntu, i’m trying to make the battery longer ( actually only 1h of duration ), I read that you installed something called TLP or something like that , could you tell my how to make it longer please ( with easy words and easy steps please ) i need the sudo apt-get install ……. in steps please! thanks! Now reboot the computer, that’s pretty much it! You can always ask questions regarding Ubuntu in the AskUbuntu.com website (it’s sort of a forum). I installed 16.10 GNOME yesterday and it’s looks good, but only looks. It works so slowly that I want to kill myself. Don’t open settings! 🙂 Your PC will stack. If you have questions, then use the Askubuntu.com website. Good luck. You’re welcome Sanjay. Manjaro 17.0 KDE is bit of an old release is it not?